The Netcare Assist App’s multiple functionalities give users access to emergency and medical information within seconds. The app offers an invaluable lifeline for any person in an emergency situation looking for medical help or needing advice, and can be downloaded for free from Apple’s App Store South Africa and the Android Market. be directed to the medical practitioners via GPS navigation. 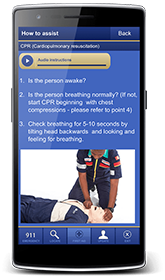 In an emergency situation you can use the app’s First Aid Assist functionality, which provides information on how to handle a range of incidences, from choking to heart attacks. You can either listen to a clip or read the information, which is often accompanied by photos illustrating the actions to be taken. You can insert medical data that could be vital to emergency services personnel or doctors treating you in a life-threatening situation into the Personal Emergency Actions Manage feature, and also e-mail this to your family or friends. For example, if you suffer from asthma, you can record that information along with contact details and a message for the person you would want to be informed if you were to have an asthma attack. This information will be saved in a list of personal emergency actions and can be used by either yourself or a third party to quickly notify your designated contact of your situation. By registering, users are able to easily access the app’s functions via tabs at the bottom of the screen. The registration form does request additional data, such as your cellphone number, ID as well as medical aid number, which can be used to help Netcare admit you to one of its hospitals. However, it is not mandatory to fill in all data to use the app. Once you have registered, the app provides you with a simple tutorial on how to use it. The app is able to also geo-locate a caller who has registered when they call Netcare 911 using the app. This enables the 911 emergency operations centre (EOC) to locate the caller more efficiently and furthermore enables the call taker at the EOC to access the user’s information. 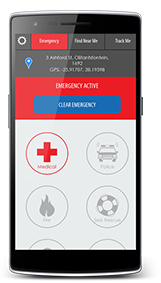 The mySOS emergency mobile app uses smartphone technology to get you the assistance you need in emergency situations, faster than ever before. This potentially life-saving service is designed to be efficient as it uses minimal battery power on your phone. In an emergency, the mySOS app sends an alert to Netcare 911’s national emergency operations centre, or other relevant emergency services, and your selected loved ones to show them your GPS location. This enables Netcare 911 to mobilise the assistance you need in the shortest possible time. The swift notification and accuracy in locating patients will help paramedics to reach medical emergencies quicker, which can often significantly improve a patient’s prospects of survival. The app also includes a setting that can track you while exercising or travelling, either by car, by bicycle, or on foot. If you do not reach your destination within a time limit set by yourself, the app will alert your emergency contacts, giving them your position and a map of the route you took, while continuing to track your location. This enables them to find out if you are in any trouble and alert Netcare 911, if needed, on 082 911, and give the call taker your GPS location. The mySOS app is easy to use and cost effective and provides extra peace of mind, particularly for people who travel, participate in outdoor sports and concerned parents. Once you are registered, mySOS provides a range of quick and easy-to-access services for a host of emergency situations. You no longer need to spend time searching for emergency numbers, explaining directions to your location and alerting your loved ones – mySOS will take care of all of this, with absolute accuracy. The app can also show you information on hospitals, police stations, doctors, dentists, pharmacies and veterinary services near your location, where you can search for your preferred or nearest service provider. You can find, phone or navigate to these services using the app. mySOS can be downloaded for iPhone or Android smartphones, at www.mysos.co.za/download.html. When registering on the app, you will be requested to enter contact numbers and email addresses for your chosen emergency contacts. The app also sends the relevant demographic and medical information that will assist the Netcare 911 dispatcher in sending the correct resource to help with your specific emergency. If you are a Netcare patient, client or member of a medical aid affiliated to the Netcare Group or Netcare 911, mySOS will link you to the Netcare 911 profile. A “button” with the Netcare 911 logo will appear on your mySOS screen, and this will provide you with direct 24-hour access to the Netcare 911 national emergency operations centre for all emergencies.